A team of mass communication, art and marketing students from Stephen F. Austin State University recently won Best Media Plan at the American Advertising Federation's National Student Advertising Competition in Corpus Christi. Since the fall semester, students have created an advertising campaign for Ocean Spray Cranberries. 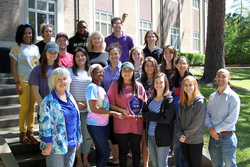 NACOGDOCHES, Texas - A team of mass communication, art and marketing students from Stephen F. Austin State University recently won Best Media Plan at the American Advertising Federation's National Student Advertising Competition in Corpus Christi. This award recognizes students for their creative use of a $10 million budget in building an advertising campaign for Ocean Spray Cranberries. Since the fall semester, students have built the campaign to increase brand relevance among millennials between the ages of 24 and 34 by conducting brand and target-market research, developing "Own the Ocean" as their central theme and strategy, budgeting and creating a media plan. During the course of the project, Tyler Fisher, graduate student from Spring, Texas, served in an advisory role to offer students advice, feedback and support. "As a second-year participant, winning an award means a lot. I know these students have worked hard to come up with something the judges will enjoy. It is a great accomplishment to be recognized for our hard work," Fisher said. Their award-winning media plan focused on social media and digital efforts and included test markets to evaluate which messages, tactics, strategies and locations would most effectively reach millennials. This project was part of an advertising course, and Dr. Seth Bradshaw, assistant professor in the Department of Mass Communication; Dr. Marlene Kahla, professor in the Department of Management and Marketing; and Peter Andrew, professor in the School of Art, worked alongside students on this endeavor. "I have learned great communication skills from participating in this class and contest," Fisher said. "I have made friends and connections from this experience, and I urge students who wish to have a career in advertising to take this class. The American Advertising Federation is a prestigious organization, and this class is essential to advancing your education and knowledge of the advertising field." SFA competed against schools such as the University of Texas at Austin, University of Houston, Texas Tech University and more. At the competition, teams of four students presented their class' campaign in a 20-minute presentation. According to the organization's website, this premier competition "provides more than 2,000 college students the real-world experience of creating a strategic advertising/marketing/media campaign for a corporate client."